This historic city named after its association with the Mughal ruler Aurangazeb is also the most convenient starting point for visiting the Ajantha and Ellora caves.Aurangabad, a big modern city has major tourist attraction. The city served the real purpose of its ancient name as the Mughals could look into the Deccan through it. 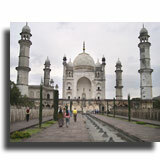 Aurangabad, in the northern part of the city of Maharashtra is situated on the Kham River. It is housed in Dundhna Valley between the Lakenvara range on the north and the satara hills on the south. Aurangabad was discovered on the site of the village called Khirki by Malik Amber, the Prime Minister of Murtaza Nizam Shah of Ahmednagar in 1610 A.D.Soon this place became very popular with his men having their full establishment in and around the place.But however this was soon destroyed by Shah Jahan in 1621.Later son of Malik Amber changed the name of Khirki to Fatehnagar which was again changed by Aurangzeb as Aurangabad and made it as his capital in 1633. Ajanta and Ellora Festivals- This is the festival which falls in the month of March. It is more like a cultural festival happening in the Ellora caves where people from different parts of the country participate in it. Aurangabad Festival- This is also another cultural festival, falling in the month of December, signify the art and culture of the place and people. Various exhibitions are held with display of handlooms and handicrafts. Buddha Jayanti- This is a major religious festival of the city during which mass prayers and processions are held. Thus dedicating the day to Lord Buddha. Dussehra- Dussehra is celebrated with full enthusiasm and it falls in the months of November to December. This festival is held for ten days and on the last day people greet each other for good luck. Khultabad Urs- This falls in the month of Rabi-Ul-Awal during which the people visit the tomb of Khawaja. Ganesh Chaturthi- This festival which occurs in the month of August or in September is the most important festival in Maharashtra.It is celebrated for nearly a week where the idols of lord Ganesha are done and worshipped and on the last day the idols are taken in procession and immersed in the river. Mahashivratri: This festival is celebrated during the months of February or March every year. Worshipers throng to at Grishneshwar temple to worship Lord Shiva on this day. Paithan Fair- This fair which is mainly to pay homage to saint Eknath Maharaj takes place on the banks of the river Godavari in the Paithan district. It falls in the month of March or April. Shivaji Jayanti- The birth anniversary of the great Maratha ruler Shivaji is celebrated on this day in the month of May. Here Lord Shiva is worshipped in the form of a giant lingam in the garba griha and it is famous for 200,000 tones of rock and is possible the world's largest monolithic structure, It is the biggest building carved in a stone in the whole world. This temple is located at the village of Verul, near Ellora caves, Ghrishneshwar Temple is an important place of Hindu pilgrimage and is chiefly dedicated to Lord Shiva. Though the city wall now remains as a ruin, it was built by Aurangazeb in 1682.The wall whose length is nearly 6 miles was mainly built to protect against the attack of the Marathas. This archeologically important gate is of nearly 52 in number of which 4 principal gates faced the cardinal points and consisted of Delhi Gate on the north, the Jalna Gate on the east, the Paithan Gate on the south and the Mecca Eate on the west. This masjid was built by Malik Amber is featured by 50 polygonal pillars arranged in 5 rows, and connected by system of arches. These pillars are said to divide the building into 27 equal compartments where each is designed very elegantly. The mosque in its front has nearly nine arches. This is small mahal built in the University campus by Bundelkhand chief. It was once upon a time mainly noted for its golden painting. The most noted structures of archaeology and history is situated in the North of the city where there are nearly 12 Buddhist caves dating back to the 1 A.D. 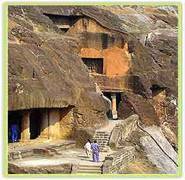 These caves are featured by viharas and sculptures portraying scenes from the Jataka tales. From here the tourists can get beautiful view of the city. This is a museum more concentrating on the Sathavahana dynasty is situated in the campus of Marathwada University. This museum remains closed on Sundays. It is housed with varieties of paintings, sculptures, decorative items of Maratha, Rajput and Mughal periods. You can also get to see the manuscripts of Persian and Arabic languages. This museum has more of the ruins of the archaeological sites in Paithan.It is located in Sonehri Mahal. 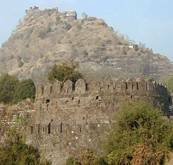 This magnificent fort dates back to the 12th century is situated in the Daulatabad city which is at a distance of about 13 km from Aurangabad. It draws the tourists attention mainly because of its location on a pyramid shaped hill. It was built by king Bhillama of Yadav dynasty. Declared by the UNESCO as one of the World Heritage Sites is situated at a distance of about 30 kms away from the city. This place initially had 34 caves sloping on the hill and later the archeology department discovered another 28 caves. The shrines here depict the faith of Buddhist, Hindu and Jain. It took a period of about 150 years to construct this and nearly 700 people worked on it. 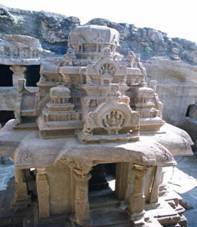 It takes the credit of the most magnificent Buddhist caves in the whole of India. 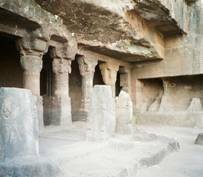 Located at about 100kms away from Aurangabad it has 30 rock-cut Buddhist caves featuring 'Chaitya grihas' and 'Viharas'. All the caves of Ajantha depicts the life of the Buddha and illustrates tales from Jatakas by paintings and sculptures. Apart from this there are number of unfinished caves. It is a small town with the holy shrine of Deccan Muslims. Also it is in this place the tomb of Emperor Aurangazeb is situated. 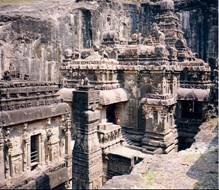 It is very close to the Ellora at a distance of about 3kms. Lonar is known for one of the world’s 5 largest craters formed nearly 50,000 years ago by a meteorite. 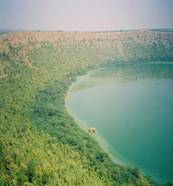 This crater is now left with a beautiful lake and its beauty is studded with temples belonging to the 12th and 13th century on its shores. This place is at a distance of about 122kms away from the city. This is one of the famous holy site of the Hindus.Shridi is about 144 kms from the city and is known for the shrine of Shridi Sai Baba. This city on the banks of the sacred river Godavari was the capital of the Satvahana dynasty. This destination is at about 56km South of Aurangabad.This place is housed with the Shrine of 'Sant Eknath'which is known for its spiritual power.Paithan, which was once an important centre of learning, is also famous for its beautiful silk saris which sport intricately embroidered gold or silver borders called 'Paithani'.The other place of interests here is the Jayakwadi Dam accompanied by a garden and fountains of water. This place at a distance of about 60 km from Aurangabad is popularly known as the 'Lake of Fairies’. There is Shiva temple on the shores of this lake. This place is also know as the mini Taj which has the tomb of Begum Rabia Durani, wife of Emperor Aurangzeb.This place is so called because it is built in a Mughal garden with axial ponds, fountains, water channels, broad pathways and pavilions. This sanctuary amidst the hilly regions Sahyadri of Aurangabad is about 65 km away from the city. It is known for the residence of sloth bear and migratory birds. Ghrishneshwar is about half a kilometer away from the Ellora Caves. This temple features an excellent architecture and carving of the 18th century and s built of spotted red sandstone. This place forms one of the five Jyotirlinga sites in Maharashtra where Lord Shiva is worshipped. Aurangabad is very well connected by roads with other major cities of Maharashtra like Pune, Nagpur, Beed, Mumbai which is now being developing into a four lane highway. There are roads not only intra states but s also connected to the other parts of the states. Aurangabad is well featured with an International Airport catering flights to neighbouring states and other countries.Aurangabad Airport has connecting flights to Delhi, Udaipur, Mumbai, Jaipur,Chennai, as well as Hyderabad. Aurangabad is directly connected by rail with Bombay, Manmad, Nasik Road, Kalyan, Hyderabad and with other cities via Manmad.